Although, I’ve had a Twitter account for awhile now, I admit I’m not proficient in the use of Twitter. For one, it can be addictive and it’s hard for me to say anything in a 140 characters. I’ve been working on my Twitter presence and thanks to Kevan Lee at Buffer for his article, Twitter Tips for Beginners, I have a number of tips to share with those of you who, like me, are still floundering beginners or, just floundering. Unless you don’t want to get anything else done -Don’t read every tweet. According to Kevan, “If you’re following 100 people, you could see 2,200 tweets per day.” I don’t have that kind of time. Use Lists: This is something I’ve used for some time now. I currently have nine lists, from writing to politics. Talk to people. If they tweet, re-tweet, mention, or favor a tweet – recognize them. Say something, after all, Twitter is about connecting with people. In the South, we call not responding – rude! Use a scheduler. I use Buffer and have for a long time. Make sure your profile is up to date, professional and says something real about who you are. Follow as many as you want and more if you can. You follow me, I’m gonna follow you. And, by the way, you can find me on Twitter @cofcmom. And, Thanks Kevan for this: No. 1 Rule of Tweeting: If you want everyone to see your tweet, don’t start it with an @ symbol. I didn’t have a clue. You’re not going to be shunned or cut off from Twitter world if you repost a Tweet more than once. Go for it. It’s okay. You might pick up a follower or two. 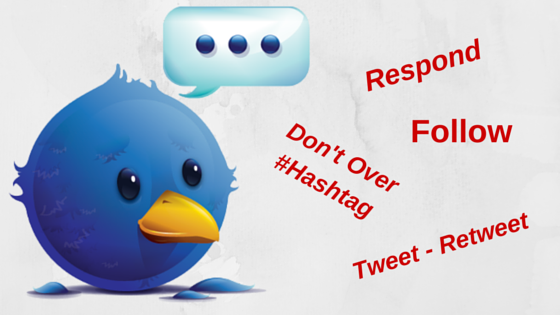 Don’t forget the # hashtag, but don’t overdo it either. According to Kevan, when you use more than two #’s, engagement drops by 17%. Who knew you could # someone to death. Kevan has a whole article on the science of #hashtags. You can check it out here. Here’s to Tweeting. I’ll see you on the Twitter playground. I’d love to hear your comments. Talk to me. Tell me your story. And as always, you can follow me on Facebook at SheilaMGood, Twitter @cofcmom, Tumblr, and Pinterest. ← Do You Make These 5 Mistakes?